Part of the Dr Martens Vegan Collection the 6 eyelet black vegan boot offers one of Dr Martens’ most classic and recognisable styles to our vegan friends. The synthetic materials used are acutely vegan-friendly but this has not precluded quality. Made with a smooth and durable black Felix Rub Off synthetic upper. 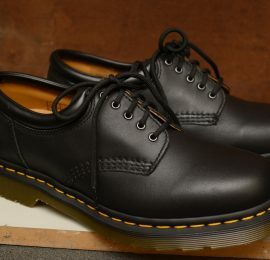 Replicates Dr Martens’ standard footwear down to the very last detail, even boasting a more natural feeling heel loop. The Goodyear welted sole is heat-sealed and welt-stitched for extra durability. The air-cushioned DMS sole is oil and fat-resistant, tough and offers good abrasion and slip resistance. Features Dr Martens’ classic yellow stitching, gold eyelets, and black boot laces. If you’re looking to personalize your boots, check out our selection of colored Shoe Laces. What IS Vegan? What IS a Vegan BOOT? The word vegan refers to anything that’s free of animal products: that is no meat, milk, eggs, wool, silks, leathers, oils, or any animal derived products anywhere in the materials. Sometimes things that we think are Vegan aren’t, as some stuff can actually harbor hidden animal products! A leather shoe is obviously not Vegan, BUT did you know that a Canvas shoe can ALSO fail the Vegan test? This is because some shoe glues actually have hidden animal stuffs used to make the glue that’s used to make the shoes! Dr Martens Vegan Shoes are Certified Vegan!! This is like the Certified Organic Stamp, it Certifies the Product as VEGAN!! Check out a list of Certified Vegan Dr Martens available at Downes Shoes here. Due to our uncompromising commitment to stocking the most serious (and Most absolutely outrageously fun and out of this world) range of Dr Martens, we are continuously adding more exciting pieces to all of our Dr Martens Footwear Ranges including our Vegan Offerings! Stay tuned here; send us an email to go into our contact list; give us a call; follow us on Facebook or Instagram to keep up to date with the freshest Docs to hit our shores! !